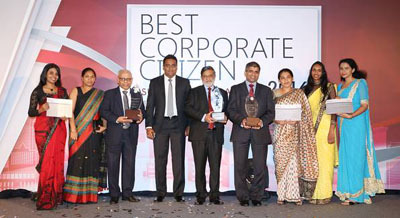 People’s Leasing & Finance (PLC) was honoured as the Second Runner-Up at the Best Corporate Citizen Sustainability Awards 2016 hosted by the Ceylon Chamber of Commerce that recognises the sustainable champions of the Sri Lankan corporate world. PLC became the sustainability champion of the finance sector and retained the coveted award as one of the Top Ten corporate citizens of the year. The Best Corporate Sustainability Awards recognise and appreciates business entities that have displayed significant corporate engagement and commitment towards sustainable development encompassing the three Ps: People, Planet and Profit. PLC has been adjudged one of the Ten Best Corporate Citizens in 2016, 2015, 2014 and 2012.